Please be patient while downloading the main conference packages. The process may take up to 20 minutes. Printed Electronics Europe is aimed at potential users of the technology that wish to learn and see new products and how they can be used in their business. The technology is of vital interest to industries as diverse as chemicals, consumer goods, healthcare, military, electronics, advertising and publishing. It is allowing electronics to be used in places it has never been before and offers new exciting form factors. Access to printed electronics products in "Demonstration Street"
This event, Europe's largest on the topic and growing rapidly every year, is your information and networking hub on the topic, with an international trade show of more than 100 exhibitors. It is the meeting place for users, suppliers, academics and investors. Printed Electronics Europe is co-located with the Photovoltaics IDTechEx event. The co-located conference will be shedding light on the latest trends from major innovators in the solar cell sector. All the latest developments in thin film, organic, printed photovoltaics as well as emerging technologies growing alongside the more established ones, such as luminescent concentrators and infrared harvesting. Attendees have access to BOTH events and the common trade show to maximise value. 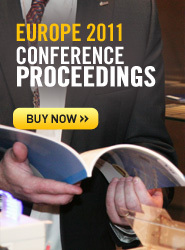 Click here for further information on Photovoltaics Europe. Have your questions answered by experts in interactive consultancy-style sessions, which will bring you up to date with the topics. Masterclass delegates also attend exclusive company visits. "For Printed Electronics, there is no other event that holds a candle to this one"
"Excellent! So many partners and customers"